AIR MILES Bonus Miles Offer: Receive 1,000 Bonus Miles after your first purchase using your Credit Card. Bonus Miles will be credited to the primary Credit Cardholder's AIR MILES Collector Account within forty-five (45) days of purchase. Receive an additional 2,000 Bonus Miles when you spend a minimum of $3,000 (less refunds and excluding cash advances, cash-like transactions, interest charges, fees, credit or debit adjustments) on purchases using the Credit Card within the first three (3) months from the Credit Card open date. The additional Bonus Miles will be credited to the primary Credit Cardholder's Collector Account within sixty (60) business days following the qualifying $3,000 spend. All Bonus Miles are credited in accordance with the set balance preference (between AIR MILES Cash and AIR MILES Dream balances) at the time of posting. Companion Flight Rebate Offer: To be credited the Dream Miles for your Companion flight ticket, you must book any two flights (one way or return) for travel anytime (subject to availability from participating suppliers at the time of booking) through airmiles.ca using your Dream Miles within twelve (12) months from the account open date. Both flight tickets must be booked in the same transaction, and on the same itinerary (both flights must be travelling on the same day, departing from the same location in Canada, and arriving to the same destination). You must have accumulated a sufficient balance of Dream Miles in your Collector Account to use for both flights in the same transaction to be eligible for this Offer. You will be credited the number of Miles back into your Dream Account that is equal to one flight ticket (excluding all taxes, fees and applicable surcharges) within 45 days after your flight booking, notwithstanding your balance preference (between AIR MILES Cash and AIR MILES Dream balances) at that time. The companion flight offer can only be applied to the 1st flight redemption after acquiring the card, no exceptions. There is a limit of one companion flight offer per eligible primary BMO AIR MILES World Elite Mastercard cardholder. To be eligible for this Offer, your BMO AIR MILES World Elite Mastercard account must be in good standing at the time such Miles are credited to your Dream Account. The Collector is responsible for paying all taxes, fees and applicable surcharges at the time of booking. There are no cancellations or refunds permitted on tickets once booked. Changes to flights may be permitted; restrictions may apply and changes are subject to applicable fees. In the event of a cancellation of either flight for any reason after booking, Dream Miles credited for the Companion flight may be deducted back from the Collector's Account. Offer cannot be combined with any other Miles redemption offer. Offer is subject to the Flight Rewards Terms and Conditions of the AIR MILES Reward Miles Program, available on airmiles.ca. These offers are subject to change or can be withdrawn without notice. Limit of one of each Offer per Collector Number. Existing BMO AIR MILES World Elite Mastercard customers who cancel their card during the "Offer Period" and existing BMO Mastercard customers who transfer into this Credit Card product during the "Offer Period" are not eligible for the Offers. If the Credit Card is cancelled within ninety (90) days from the date it was opened, all Miles earned within that period will be cancelled and the Companion Flight Miles (if applicable) will be clawed back. The AIR MILES Bonus Miles Offer and the Companion Flight Rebate Offer are each subject to the AIR MILES Reward Program Terms and Conditions. ‡800 AIR MILES Bonus Miles offer is limited to new accounts. Applications must be received between November 1, 2018 and October 31, 2019 ("Offer Period"). Existing BMO AIR MILES Mastercard customers who cancel their card during the Offer Period, and existing BMO Mastercard customers who transfer into this product during the Offer Period are not eligible. 400 Bonus Miles will be applied to your AIR MILES Collector Account within forty-five (45) days after your first card purchase. Additional 400 Bonus Miles will be awarded when you spend $1,000 in net card purchases (less refunds and excluding cash advances, cash-like transactions, interest charges, fees, credit or debit adjustments) in the first three (3) months from the account open date and will be applied to your Collector Account within forty-five (45) days after qualifying. All Bonus Miles will be credited in accordance with the set balance preference (between AIR MILES Cash and AIR MILES Dream balances) at the time of posting. Limit of one Bonus offer per Collector Account. If you cancel your card within ninety (90) days of opening your account, the Bonus reward miles will be cancelled. This offer may be changed, extended or withdrawn at any time without notice. §a) Subject to these Terms and Conditions, each balance transfer amount is eligible for a promotional interest rate of 1.99% provided that each balance transfer is posted to your BMO AIR MILES Mastercard account (the "Account") in the first 9 (nine) statement periods from the Account open date ("Promotional Period") , and your Account remains in good standing. Offer is available to new customers only upon Account approval for applications submitted on or after November 1, 2018. Balances from other BMO credit card accounts are not eligible to be transferred. The promotional rate will no longer apply to your Account if you transfer into a card other than the BMO AIR MILES Mastercard. Balance transfers apply to Canadian dollar amounts only. d) If your Account has balances with different interest rates, such as purchases with a standard interest rate and balance transfers with a promotional interest rate, any payment that exceeds the minimum payment will be allocated proportionately to those balances according to the terms set out in section 14 of the BMO Mastercard Cardholder Agreement. For example, if you have an $800 purchases balance at the standard interest rate and a $200 balance transfer balance at a promotional interest rate, 80 per cent of your payment will be allocated to your purchases balance and 20 per cent will be allocated to your balance transfer balance. This offer may be withdrawn or changed without notice. §§a) Subject to these Terms and Conditions, each balance transfer amount is eligible for a promotional interest rate of 1.99% provided that each balance transfer is posted to your BMO CashBack Mastercard account or BMO Rewards Mastercard account (the "Account") in the first 9 (nine) statement periods from the Account open date ("Promotional Period") , and your Account remains in good standing. Offer is available to new customers only upon Account approval for applications submitted on or after August 8, 2018. Balances from other BMO credit card accounts are not eligible to be transferred. The promotional rate will no longer apply to your Account if you transfer into a card other than the BMO CashBack Mastercard or BMO Rewards Mastercard. Balance transfers apply to Canadian dollar amounts only. ‡‡BMO CashBack Mastercard and BMO SPC CashBack Mastercard applications must be received between November 30, 2018 and November 30, 2019. You will earn 5% cash back for every dollar spent or $5.00 back for every $100.00 spent (less refunds and excluding cash advances, cash-like transactions, interest charges, fees, credit or debit adjustments) in the first three (3) billing cycles from the account open date up to a maximum of $2,000 ($100 cash back) in eligible card purchases. After the first three (3) billing cycles or $2,000 in card purchases (whichever comes first), you will earn 1% cash back or $1.00 back for every $100.00 on all card purchases. The 5% cash back offer is limited to new BMO CashBack Mastercard accounts and will not be awarded to current or former cardholders who reinstate a closed account, product transfer, or who open a new account. Limit of one bonus offer per account. If you cancel your card within ninety (90) days from the date your account is opened, all CashBack rewards earned within that period will be cancelled. This offer may be withdrawn or changed without notice. †*800 AIR MILES Bonus Miles offer is limited to new accounts. Applications must be received between October 2, 2018 and April 30, 2019 ("Offer Period"). Existing BMO AIR MILES Mastercard customers who cancel their card during the Offer Period, and existing BMO Mastercard customers who transfer into this product during the Offer Period are not eligible. 400 Bonus Miles will be applied to your AIR MILES Collector Account within forty-five (45) days after your first card purchase. Additional 400 Bonus Miles will be awarded when you spend $1,000 in net card purchases (less refunds and excluding cash advances, cash-like transactions, interest charges, fees, credit or debit adjustments) in the first three (3) months from the account open date and will be applied to your Collector Account within forty-five (45) days after qualifying. All Bonus Miles will be credited in accordance with the set balance preference (between AIR MILES Cash and AIR MILES Dream balances) at the time of posting. Limit of one Bonus offer per Collector Account. If you cancel your card within ninety (90) days of opening your account, the Bonus reward miles will be cancelled. This offer may be changed, extended or withdrawn at any time without notice. **BMO CashBack World Elite Mastercard applications must be received between November 30, 2018, and November 30, 2019. You will earn 5% cash back for every dollar spent or $5.00 back for every $100.00 spent (less refunds and excluding cash advances, cash-like transactions, interest charges, fees, credit or debit adjustments) in the first three (3) billing cycles from the account open date up to a maximum of $4,000 ($200 cash back) in eligible card purchases. After the first three (3) billing cycles or $4,000 in card purchases (whichever comes first), you will earn 1.50% cash back or $1.50 back for every $100.00 on all card purchases. The 5% cash back offer is limited to new BMO CashBack World Elite Mastercard accounts and will not be awarded to current or former cardholders who reinstate a closed account, product transfer, or who open a new account. Limit of one bonus offer per account. If you cancel your card within ninety (90) days from the date your account is opened, all CashBack rewards earned within that period will be cancelled. This offer may be withdrawn or changed without notice. *Bonus offer is limited to new accounts. Applications must be received between January 4, 2016, and October 31, 2017. 2,500 CashBack bonus points ($25 in CashBack rewards) are only available to new BMO CashBack Mastercard cardholders and will be applied to your account within forty-five (45) days after your first card purchase and not be awarded to current or former cardholders who reinstate a closed account or who open a new account. An additional 5,000 CashBack points ($50 in CashBack rewards) will be awarded when you spend $1,500 in net card purchases (less refunds and excluding cash advances, cash-like transactions and balance transfers) in the first three (3) months from the account open date and will be applied to your account within sixty (60) days after qualifying. Limit of one bonus offer per Account. If you cancel your card within ninety (90) days of opening your account, the Bonus points will be cancelled. This offer is time limited and may be changed, extended or withdrawn at any time without notice. ***The $20 cash back reward offer is limited to new BMO CashBack Mastercard accounts. Your acceptance of the offer must be received between July 27 and Oct 31, 2017 ("Offer Period"). You must make a first card purchase with your new BMO CashBack Mastercard card to receive the one-time $20 cash back reward which will be applied to your account within forty-five (45) days of your first card purchase. The 2% cash back rewards offer applies to eligible purchases charged to your account (less refunds and excluding cash advances, cash-like transactions, interest charges, fees, credit or debit adjustments) in the first six (6) months from the date your account is opened and is subject to the CashBack Rewards Terms and Conditions and your BMO Mastercard Cardholder Agreement. Existing BMO CashBack Mastercard customers or those who cancel their card during the Offer Period and existing BMO Mastercard customers who transfer into this product are not eligible. CashBack rewards are accumulated over the statement period and will appear on your statement no later than the month after they are earned. The number of CashBack rewards is rounded down to the nearest cent. Your credit card account must be in good standing at the time the CashBack rewards are awarded. CashBack rewards will be credited to the primary cardholder's account. If you cancel your card within one hundred and eighty (180) days from the date your account is opened, all CashBack rewards earned in that period will be cancelled. This offer may be withdrawn or changed without notice. ∆a) Subject to these Terms and Conditions, each balance transfer amount is eligible for a promotional interest rate of 3.99% provided that each balance transfer is posted to your BMO Preferred Rate Mastercard account (the "Account") in the first 9 (nine) statement periods from the Account open date ("Promotional Period") , and your Account remains in good standing. Offer is available to new customers only upon Account approval for applications submitted on or after January 15, 2018. Balances from other BMO credit card accounts are not eligible to be transferred. The promotional rate will no longer apply to your Account if you transfer into a card other than the BMO Preferred Rate Mastercard. Balance transfers apply to Canadian dollar amounts only. *+*Based on the calculation that 20% of spend per month are purchases made at participating AIR MILES Partners. 1a. The 20,000 BMO Rewards welcome bonus points offer is limited to new BMO Rewards Mastercard accounts. Applications must be received between March 1, 2018 and October 31, 2019 ("Offer Period") to be eligible for this offer. Receive 10,000 BMO Rewards points after your first card purchase. 10,000 BMO Rewards points will be applied to your BMO Rewards Collector Account following the first statement after your first card purchase. Receive an additional 10,000 BMO Rewards points when you spend a minimum of $1,000 (less refunds and excluding cash advances, cash-like transactions, interest charges, fees, credit or debit adjustments) within the first three (3) months from the account open date. The additional 10,000 BMO Rewards points will be credited to your Collector Account within sixty (60) business days following the qualifying $1,000 spend. This offer is not available to current or former BMO Rewards Mastercard cardholders who reinstate a closed account or open a new account. If a cardholder cancels their account within 30 days from the account open date the welcome bonus will be cancelled. Existing BMO credit card cardholders who transfer into this product during the Offer Period are not eligible for this offer. Offer may be changed without notice. 1b. Only BMO World Elite Mastercard applications received between December 17, 2018 and February 28, 2019 (the "Offer Period") will be eligible for the $100 bonus offer (the "Offer"). To qualify for the Offer, you must spend a minimum of $100 (less refunds and excluding cash advances, cash-like transactions, interest charges, fees, credit or debit adjustments) on travel related purchases within the first six (6) months from the account open date using your new BMO World Elite Mastercard. To earn the $100 bonus, your purchases must be made at merchants that are classified in the Mastercard network as: airlines, hotels/resorts, cruise lines, passenger railways, travel agencies and tour operators ("Applicable Merchants"). The $100 bonus will be applied as a statement credit to the Account of the primary cardholder by September 30, 2019. This offer is not available to current or former BMO World Elite Mastercard cardholders who reinstate a closed account or open a new account during the Offer Period. Existing BMO credit card cardholders who transfer into this product during the Offer Period are not eligible for this offer. If you cancel your card within ninety (90) days of account opening, the bonus will be cancelled. Your account must be open and in good standing at the time the reward is credited. This offer may be withdrawn or changed without notice. 1c. 35,000 points are not redeemable for cash and can be redeemed for a ticket for a short haul flight in economy class with a minimum ticket price of $250 at bmorewards.com. You can redeem for travel rewards at bmorewards.com or by calling the BMO Rewards Centre. Points can be used to cover any applicable taxes and fees. If you don't have enough points to redeem a particular travel reward, you can top up the number of points you need by purchasing those points on your card. There is no maximum top up amount for travel rewards. There is no online booking fee. We charge fees plus applicable taxes for each phone reservation, modification or cancellation of a travel reservation. For fees, please see the Important Information enclosure that is provided with your BMO credit card and any notice that we may provide you. Supplier fees for each change or cancellation to your travel arrangements may also apply and will be disclosed at the time of booking based on your specific travel reservation. Booking fees, change fees and cancellation fees are non-refundable. All travel rewards are subject to availability. Additional points or cash can be used to pay for all or a portion of the flight taxes and fees or a higher value flight. BMO World Elite Mastercard applications must be received between October 2, 2018 and March 31, 2019 (the "Offer Period") to be eligible for this offer. 35,000 BMO Rewards welcome bonus points will be applied to your BMO Rewards Collector Account after you spend a minimum of $3,000 (less refunds and excluding cash advances, cash-like transactions, interest charges, fees, credit or debit adjustments) within the first three (3) months from the account open date. 35,000 BMO Rewards welcome bonus points will be applied to your BMO Rewards Collector Account following the first statement after the eligible $3,000 spend. The primary cardholder annual fee of $150 will be waived for the first year. After the first year, the annual fee will appear on your Credit Card statement twelve (12) months after the Credit Card open date. Offer does not apply to the Additional Card annual fee. This offer is not available to current or former BMO World Elite Mastercard cardholders who reinstate a closed account or open a new account during the Offer Period. Existing BMO credit card cardholders who transfer into this product during the Offer Period are not eligible for this offer. If you cancel your card within ninety (90) days of account opening, the welcome bonus will be cancelled. This offer may be withdrawn or changed without notice. A. Offer is cumulative over the statement period. Award of CashBack rewards is made for purchases charged to your account (less refunds and excluding cash advances, cash-like transactions, interest charges, fees, credit or debit adjustments) and is subject to the CashBack Rewards Terms and Conditions and the BMO Mastercard Cardholder Agreement. The number of CashBack rewards will be rounded down to the nearest cent. *Conditions: CashBack World Mastercard: With the BMO CashBack World Mastercard card, you will only earn CashBack rewards on your account up to a maximum monthly spend of $7,000. B. Offer is cumulative over the statement period. Award of CashBack rewards is made for purchases charged to your account (less refunds and excluding cash advances, cash-like transactions, interest charges, fees, credit or debit adjustments) and is subject to the CashBack Rewards Terms and Conditions and the BMO Mastercard Cardholder Agreement. The number of CashBack rewards will be rounded down to the nearest cent. BMO Rewards redemptions are subject to fees and charges. For details, please see the fees, charges, and pricing policy in the BMO Rewards Terms and Conditions as well as the Important Information about BMO Mastercard cards enclosure. BMO Rewards points will not expire as long as the BMO World Elite Mastercard card or BMO Rewards Mastercard account (each hereafter referred to in this paragraph as the "Account") remains open and in good standing, except as described in the section of the BMO Rewards Terms & Conditions, which deals with the program termination. On cancellation of the Account, a cardholder will have 90 days in which to do either of the following: (i) redeem the points earned for one or more rewards; or (ii) reinstate the points by either reinstating the Account or opening a new Account and linking the points account that was attached to the cancelled Account to the new Account. After the ninety day period, unless the points are reinstated, any points that remain in the points account will expire. For details, please refer to the BMO Rewards Terms and Conditions for further details. If your card is used without your authorization, you will not be liable if: you did not contribute to the unauthorized use, you used reasonable care to safeguard your card and PIN, and you notified us by telephone within 24 hours after you learned of the loss, theft or misuse of your card or cheques, or after you suspected that someone else knows your PIN . If you don't meet these criteria, you will be liable for all charges incurred in connection with the unauthorized use. A. You will earn 3 BMO Rewards points for every $1 in eligible travel, dining and entertainment purchases, up to $50,000 annually (January to December statement cycle period). The 3 BMO Rewards points includes the base earn rate of 2 BMO Rewards points for every $1 in card purchases ("Base Rewards") and the bonus of 1 BMO Rewards point for every $1 in eligible travel, dining and entertainment purchases ("Bonus Rewards"). To earn Bonus Rewards, your purchases must be made at merchants that are classified in the Mastercard network as: airlines, car rental agencies, hotels/resorts, cruise lines, passenger railways, tour operators, timeshares, travel agencies and tour operators, dining: eating places, restaurants, drinking places, fast food restaurants and entertainment including motion picture theatres, theatrical producers, ticket agencies, bands, orchestras and miscellaneous entertainers, tourist attractions and exhibits, amusement parks, carnivals, circuses, aquariums, dolphinariums, zoos and seaquariums ("Applicable Merchants"). If you exceed $50,000 in combined annual purchases, you will continue to earn the Base Rewards. Some merchants may sell the same or similar products/services as the Applicable Merchants or are separate merchants who are located on the premises of the Applicable Merchants, but are classified by Mastercard in another manner ("Other Merchants"). You will only earn Base Rewards for purchases made at Other Merchants. B. Subject to the BMO Rewards Terms and Conditions, BMO Rewards points are calculated based on purchases of goods or services charged to the BMO World Elite Mastercard or the BMO Rewards Mastercard account, less any refunds or adjustments, rounded down to the nearest whole point. Cash advances (including purchases of foreign currency or travellers cheques), interest charges, fees, credit or debit adjustments and any amount other than purchases that may be charged to the account with the card, do not qualify for points. Bank of Montreal may establish other qualifying and non-qualifying transactions from time to time. A. BMO World Elite Mastercard cardholders will earn 2 bonus BMO Rewards points at participating National Car Rental and Alamo Rent-A-Car locations. BMO Rewards points are awarded per transaction in any monthly billing period. B. BMO Rewards Mastercard cardholders will earn 2x BMO Rewards points at participating National Car Rental and Alamo Rent-A-Car locations. BMO Rewards points are awarded per transaction in any monthly billing period. Important details are contained in the booklet that will follow under separate cover with your BMO Mastercard. Insurance benefits provided by Chubb Insurance Company of Canada. A. BMO AIR MILES World Mastercard cardholders receive 2x the Miles for every $15 spent. Miles are awarded per transaction at participating National Car Rental and Alamo Rent-A-Car locations in any monthly billing period. The number of Miles will be rounded down to the nearest whole number. Fractions of Miles will not be awarded. B. BMO AIR MILES World Elite Mastercard cardholders receive 2x the Miles for every $10 spent. Miles are awarded per transaction at participating National Car Rental and Alamo Rent-A-Car locations in any monthly billing period. The number of Miles will be rounded down to the nearest whole number. Fractions of Miles will not be awarded. Exclusive 15% Flight Discount: Fly on any AIR MILES flight within North America for 15% fewer Miles when you book through airmiles.ca or by calling 1-888-247-6453. For example, you could redeem a 1,300 Miles flight for only 1,105 Miles. * *If you have the BMO AIR MILES World Elite Mastercard, when you redeem Miles for a flight in North America you will receive a 15% discount from the number of Miles you would ordinarily require. North America includes flight travel within Canada, from Canada to the United States of America, including Hawaii and Alaska, excluding Puerto Rico and flight travel within the United States, and flight travel to and from Mexico. This benefit does not apply to Cash + Miles Rewards. For flight redemptions: There are no blackout periods. This benefit does not apply to the cash portion of the flight redemption (such as airport improvement fees and booking fees) or to the flight component of package vacations and cruises. The mileages quoted are for low season, round-trip travel on economy flights under the regular AIR MILES flight offer. This benefit cannot be combined with any other offer. To redeem for Travel Rewards, you must have accumulated sufficient AIR MILES Miles in your Dream Balance. Collectors must pay applicable surcharges, fees and taxes on air travel Rewards. Travel Rewards may be subject to a minimum advance booking and availability from participating Suppliers. For complete details, see current Program Terms and Conditions available at airmiles.ca or the AIR MILES Customer Care Centre at 1-888-AIR MILES (in Toronto (416) 226-5171). Offer is cumulative over the statement period. Reward miles will be earned on purchases made at participating Shell locations in Canada (including, Beaver, Turbo and Payless) to a maximum of $2,500 in any monthly billing period. The number of reward miles will be rounded down to the nearest whole number. Fractions of reward miles will not be awarded. Earn Miles twice when you use your BMO AIR MILES Mastercard and show your AIR MILES Card at AIR MILES Partners. The amount of Miles you earn depends on the earn rate offered by the AIR MILES Partner and the earn rate offered on your BMO AIR MILES credit card. A. Offer is cumulative over the statement period. Award of Miles is made for purchases charged to your account (less refunds and excluding cash advances, cash-like transactions, interest charges, fees, credit or debit adjustments) and is subject to the AIR MILES Terms and Conditions and the BMO Mastercard Cardholder Agreement. The number of Miles will be rounded down to the nearest whole number. Fractions of Miles will not be awarded. *Conditions: AIR MILES World Mastercard: With the BMO AIR MILES World Mastercard card, you will only earn Miles on your account up to a maximum monthly spend of $7,000. B. Offer is cumulative over the statement period. Award of Miles is made for purchases charged to your account (less refunds and excluding cash advances, cash-like transactions, interest charges, fees, credit or debit adjustments) and is subject to the AIR MILES Terms and Conditions and the BMO Mastercard Cardholder Agreement. The number of Miles will be rounded down to the nearest whole number. Fractions of Miles will not be awarded. C. 2x the Miles: As of May 16, 2018, BMO AIR MILES Mastercard cardholders will earn 2 AIR MILES Reward Miles for every $20 in purchases at participating AIR MILES Partners. Participating AIR MILES Partners may be added or removed at any time without notice, visit airmiles.ca/2xMiles for Partner details. Miles will be calculated on the total eligible cumulative purchases made at all participating AIR MILES Partners and credited to your account within 90 days after the end of the applicable statement period. The number of Miles earned will be rounded down to the nearest whole number. Fractions of Miles will not be awarded. Eligible purchases are purchases charged to your credit card account (less refunds and excluding cash advances, cash-like transactions, interest charges, fees and credit or debit adjustments). The "2x the Miles" benefit is available on eligible purchases beginning May 16, 2018 and may be withdrawn or changed at any time without notice. The "2x the Miles" benefit is applicable to the following BMO Credit Card products with no annual fee: BMO AIR MILES Mastercard, BMO IGA AIR MILES Mastercard, BMO Sobeys AIR MILES Mastercard, BMO Shell AIR MILES Mastercard, BMO Affinity AIR MILES Mastercard cards (excluding BMO SPC Affinity AIR MILES Mastercard cards & the BMO SPC AIR MILES Mastercard). This benefit does not apply to any BMO AIR MILES Mastercard not named in the above list. D. A list of participating AIR MILES Partners can be found at airmiles.ca/2xMiles. This offer is not transferable and is valid only for the BMO SPC AIR MILES Mastercard cardholder. Offer may be changed without notice. AIR MILES Reward Miles will be earned at a rate of 2 Miles (1 Bonus Mile plus 1 Reward Mile) for every $20 spent at participating AIR MILES Partners. Miles will be calculated on the total eligible cumulative purchases made at all participating AIR MILES Partners during the period May 16, 2018 to April 30, 2019. The number of Miles earned will be rounded down to the nearest whole number. Fractions of Miles will not be awarded. Eligible purchases are purchases charged to your credit card account (less refunds and excluding cash advances, cash-like transactions, interest charges, fees and credit or debit adjustments). For example, if your total eligible purchases made at participating AIR MILES Partners totaled $248, then 24 Miles would be awarded according to the following calculation: $248 divided by $20 equals 12.4 times 2 equals 24.8 Miles. BMO AIR MILES Mastercard cardholders receive 1.5x the Miles for every $20 spent. Miles are awarded per transaction at participating National Car Rental and Alamo Rent-A-Car locations in any monthly billing period. Offer is cumulative over the statement period. The number of Miles will be rounded down to the nearest whole number. Fractions of Miles will not be awarded. Bonus Cashback rewards are awarded per transaction at participating National Car Rental and Alamo Rent-A-Car locations in any monthly billing period. Offer is cumulative over the statement period. The number of CashBack rewards will be rounded down to the nearest cent. With the BMO CashBack World Mastercard and BMO CashBack World Elite Mastercard, you will receive a free membership in the Dominion Automobile Association (DAA) and the benefits of their BMO Roadside Assistance Program (Basic Coverage). Membership terms and the features of the plan are described in the Certificate you will receive. DAA requires that BMO provide any information reasonably required solely for the purpose of confirming that you are covered by the Program. You will earn bonus CashBack rewards for purchases made at participating Shell locations in Canada to a monthly maximum of $2,500 in Shell purchases in any monthly billing period. CashBack rewards will be rounded down to the nearest cent. One year is the twelve-month period between annual fee-billing dates. If you qualify for the rebate, a credit equal to the annual fee will appear on the same statement in which your annual fee is billed. Subject to terms and conditions, including limitations, exclusions and other important information contained in the BMO World Mastercard Travel Protection Certificate of Insurance, which is sent to new cardholders. Insurance benefits provided by Allianz Global Risks US Insurance Company (Canadian Branch) except Common Carrier Accidental Death and Dismemberment Insurance provided by Chubb Insurance Company of Canada. All rewards are subject to the terms and conditions of the AIR MILES Reward Program and are subject to change and may be withdrawn without notice. Some restrictions apply. Quantities may be limited. Flights are based on the AIR MILES Reward Program Low Season schedule. Required number of reward miles is determined by the departure date. All reward miles quoted are for round-trip travel. Collectors must pay taxes, fuel surcharges and other applicable charges and fees on air travel Rewards. Travel Rewards may be subject to a minimum 2-day advance booking and availability from participating Suppliers. Additional flight options may be offered requiring additional reward miles. For complete details, see current Program Terms and Conditions available at airmiles.ca or the AIR MILES Customer Care Centre at 1-888-247-6453 (in Toronto 416-226-5171). A. Mastercard Airport Experiences provided by LoungeKey ("MCAE") is a worldwide program run by LoungeKey Ltd. This benefit will be available to all cardholders of a BMO World Elite Mastercard ("eligible cardholders"). Eligible cardholders are required to comply with the Conditions of Use available online at airport.mastercard.com or on the MCAE mobile application, as well as any additional terms and conditions applicable to the lounge or offer being used by the eligible cardholder. The Conditions of Use are subject to change from time to time without notice to Issuer or the eligible cardholders. Eligible cardholders wishing to access a participating MCAE lounge must present their valid, eligible BMO World Elite Mastercard or their mobile access code (this may be obtained by the eligible cardholder by registering an account at airport.mastercard.com or through the MCAE mobile application) to the lounge receptionist and reference "Mastercard Airport Experiences provided by LoungeKey." Value and benefits of the MCAE complimentary membership are subject to change without notice. Use the four complimentary passes for yourself or to cover the cost of the lounge visit of your travelling companion. After using four passes, you can continue to enjoy lounge access for a fee of just US$27 per person, per visit. B. Mastercard Airport Experiences provided by LoungeKey ("MCAE") is a worldwide program run by LoungeKey Ltd. This benefit will be available to all eligible cardholders of a BMO AIR MILES World Elite Mastercard ("eligible cardholders"). Eligible cardholders are required to comply with the Conditions of Use available online at airport.mastercard.com or on the MCAE mobile application, as well as any additional terms and conditions applicable to the lounge or offer being used by the eligible cardholder. The Conditions of Use are subject to change from time to time without notice to Issuer or the eligible cardholders. Eligible cardholders wishing to access a participating MCAE lounge must present their valid, eligible BMO AIR MILES World Elite Mastercard or their mobile access code (this may be obtained by the eligible cardholder by registering an account at airport.mastercard.com or through the MCAE mobile application) to the lounge receptionist and reference "Mastercard Airport Experiences provided by LoungeKey." Value and benefits of the MCAE complimentary membership are subject to change without notice. Use the two complimentary passes for yourself or to cover the cost of the lounge visit of your travelling companion. After using two passes, you can continue to enjoy lounge access for a fee of just US$27 per person, per visit. C. Mastercard Airport Experiences provided by LoungeKey ("MCAE") is a worldwide program run by LoungeKey Ltd. This benefit will be available to all cardholders of a BMO AIR MILES World Mastercard, BMO Cashback World Mastercard or BMO Cashback World Elite Mastercard (all "eligible cardholders"). Eligible cardholders are required to comply with the Conditions of Use available online at airport.mastercard.com or on the MCAE mobile application, as well as any additional terms and conditions applicable to the lounge or offer being used by the eligible cardholder. The Conditions of Use are subject to change from time to time without notice to Issuer or the eligible cardholders. Eligible cardholders wishing to access a participating MCAE lounge must present their valid, eligible BMO Mastercard or their mobile access code (this may be obtained by the eligible cardholder by registering an account at airport.mastercard.com or through the MCAE mobile application) to the lounge receptionist and mentioning "Mastercard Airport Experiences provided by LoungeKey." Some offers may be subject to a per-person, per-visit charge. Where applicable and dependent upon the offer, access charges, including those for an accompanying guest, may be charged to your credit card. Value and benefits of the MCAE complimentary membership are subject to change without notice. Enjoy lounge access for a fee of just US$27 per person, per visit. All flight options shown are estimates only. Actual number of BMO Rewards points required varies based on the retail price of the ticket available at the time of booking. You can transfer funds from your BMO bank account to your BMO Prepaid Travel Mastercard immediately through BMO Telephone, Online and Mobile Banking. Making a bill payment to your BMO Prepaid Travel Mastercard at a BMO ATM from your BMO bank account may take up to two (2) days to process. Other financial institutions that currently allow bill payments to your BMO Prepaid Travel Mastercard include: RBC Royal Bank, Scotiabank, CIBC, PC Financial, HSBC and Laurentian Bank, ATB (Alberta Treasury Board) and TelPay. Please check directly with your financial institution to find out if you can load funds to your BMO Prepaid Travel Mastercard. If your financial institution does not support bill payments to your BMO Prepaid Travel Mastercard, visit a BMO branch to open a deposit account. The minimum amount you can load into the account is CDN$100. The maximum amount you can load into the account is CDN$10,000. The maximum credit balance on the account, including any additional cards, is CDN$10,000. Please refer to your BMO Mastercard or BMO Prepaid Travel Mastercard Cardholder Agreement for more information. Please contact the service team directly to set up automatic monthly payments from your BMO Chequing Account. Membership terms and the features of the plan are described in the certificate that you will receive. Dominion Automobile Association requires BMO to provide any information reasonably required for the sole purpose of confirming that you are covered by the Program. This service is GST applicable (registration # 10039-0095) for clients residing in MB, SK, BC, AB, NU, YT, & NT. This service is GST (registration # 10039-0095) and QST (registration # 1000042494) applicable for customers residing in Quebec. This service is HST applicable for clients residing in PEI, ON, NB, NS, & NL. Mastercard contactless is available on most personal BMO credit cards. Mastercard contactless is not available at this time on BMO Affinity Mastercard cards, BMO Prepaid Travel Mastercard cards, BMO Mastercard for Business cards and BMO Harris Private Banking Mastercard cards. For more information, call the Customer Contact Centre at 1-800-263-2263. All benefits described herein are subject to EXCLUSIONS AND LIMITATIONS. Benefits are reduced to Life insurance only at the age of 70. Please refer to your Certificate of Insurance for details of your coverage. Subject to terms and conditions, including limitations, exclusions and other important information contained in the BMO AIR MILES World Elite Travel and Medical Protection Certificate of Insurance, which is sent to new cardholders. Out-of-Province/Out-of-Country Emergency Medical benefits are available to cardholders under the age of 65. Insurance benefits provided by Allianz Global Risks US Insurance Company (Canadian Branch). Subject to terms and conditions, including limitations, exclusions and other important information contained in the BMO CashBack World Elite Travel and Medical Protection Certificate of Insurance, which is sent to new cardholders. Out-of-Province/Out-of-Country Emergency Medical benefits are available to cardholders under the age of 65. Insurance benefits provided by Allianz Global Risks US Insurance Company (Canadian Branch). Subject to terms and conditions, including limitations, exclusions and other important information contained in the BMO Common Carrier Certificate of Insurance, which is sent to new cardholders. Insurance benefits provided by Chubb Insurance Company of Canada. The premium is $0.94 per $100 of your total average daily balance for the billing cycle plus applicable provincial taxes. This average daily balance is obtained by adding up your credit card account balances from the end of each day in the billing cycle, including any interest and other charges. That amount is then divided by the number of days in the billing cycle to get the total average daily balance. Subject to Terms and Conditions, including limitations and exclusions contained in the BMO Credit Card Balance Protection Certificate of Insurance. Please refer to the Certificate for further details. Insurance benefits provided by The Manufacturers Life Insurance Company for life, critical illness, total disability, hospitalization, and terminal illness caregiving benefits and First North American Insurance Company for the job loss benefit. Subject to terms and conditions, including additional limitations and exclusions, contained in the Certificate of Insurance, which is sent upon enrollment. Please refer to the Certificate for further details. BMO Mastercard insurance benefits provided by Allianz Global Risks US Insurance Company (Canadian Branch). Earn 3% CashBack for card purchases made at participating National Car Rental & Alamo Rent A Car locations worldwide, on a per-transaction basis. The number of CashBack rewards will be rounded down to the nearest whole number. Fractions of CashBack rewards will not be awarded. Mastercard contactless is available on most personal BMO credit cards. Mastercard contactless is not available on BMO Prepaid Travel Mastercard cards and select affinity credit cards. For more information, call the Customer Contact Centre at 1-800-263-2263. Redeem AIR MILES reward miles in the Cash balance of your Collector Account in-store in increments of ninety-five (95) reward miles for $10 off your purchases at participating AIR MILES Sponsor locations to a maximum of $750 per day and online at airmiles.ca/cash in increments of ninety-five (95) reward miles for every $10 value from participating AIR MILES eVoucher Partners to a maximum of $750 per day. eVouchers can be used at participating eVoucher Partners' locations in Canada only. See specific eVoucher reward page for details and any restrictions. Visit airmiles.ca/cash to learn more. You must have accumulated sufficient reward miles in the Cash balance of your Collector Account to redeem reward miles towards in-store purchases and eVouchers. All rewards offered are subject to the Terms and Conditions of the AIR MILES Reward Program, are subject to change and may be withdrawn without notice. For complete details, visit airmiles.ca. Subject to terms and conditions, including limitations, exclusions and other important information contained in the BMO World Elite Total Travel and Medical Protection Certificate of Insurance, which is sent to new cardholders. Out-of-Province/Out-of-Country Emergency Medical benefits are available to cardholders under the age of 65. Insurance benefits provided by Allianz Global Risks US Insurance Company (Canadian Branch) except Common Carrier Accidental Death and Dismemberment Insurance provided by Chubb Insurance Company of Canada. Subject to terms and conditions, including limitations, exclusions and other important information contained in the BMO World Elite 31 Day Medical Protection Certificate of Insurance, which is sent to new cardholders. Out-of-Province/Out-of-Country Emergency Medical benefits are available to cardholders under the age of 75. Insurance benefits provided by Allianz Global Risks US Insurance Company (Canadian Branch). With a special offer cash-back rate of 5% in your first three months of cardmembership**, the BMO® CashBack® World Elite® Mastercard® certainly caught our attention. This offer is valid up to $4,000 in spending (so up to $200 in cash-back), before the rate reverts to a more modest 1.5%2B. The real benefit to this card comes not from its rate of return, but from its flexibility. You earn cash-back on ALL card purchases, without restriction! This flexibility is a real plus to those of us who don't have the time or inclination to limit our shopping to a few specific vendors. You can shop wherever you like, safe in the knowledge that your credit card is working overtime to get you some money back. 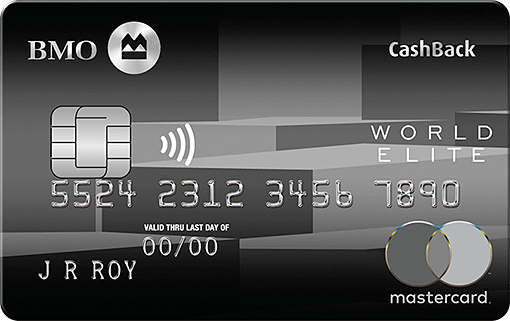 If you're looking for card perks, the BMO® CashBack® World Elite® Mastercard® doesn't disappoint. Generous travel and shopping insurance coverage is included37, and you get access to VIP airport lounges, roadside assistance19 and the BMO Concierge Service. Overall, the 1.5% cash-back rate won't make you rich, but this card is jam-packed with benefits designed to save you time and money. If you value convenience and flexibility, this Mastercard could be the one for you. So, how does this stack up to other cash-back credit cards? We crunched the numbers using our Best of Finance methodology to see how much you could earn over a 24-month period. Cash-back earned over a 24-month period: $568.68. Total (subtracting annual fee): $328.68. This total includes the 5% promotional cash-back rate in the first three months of cardmembership. Without radically changing your routine, you can easily earn enough to freshen up your wardrobe, or treat yourself to a fancy weekend away. Experience free membership to Mastercard Airport Experiences provided by LoungeKey26C. Access to a roadside assistance program. Get travel and medical insurance protection38, including out-of-Province emergency medical benefits up to $2 million, trip interruption or cancellation, and more. The shopping insurance coverage includes extended warranty and purchase protection37. Enjoy free 24-hour access to the BMO Concierge Service. They are at your disposal to assist with restaurant reservations, theatre ticket information and other scheduling tasks. The card has an annual fee of $1208, which is about average, but you can find some other similarly priced cards that earn more cash-back. After the first three months of having the card, you only earn 1.5% cash-back on your purchases2B. Eligibility requirements are high. You need a minimum annual income of $80,000 (individual) or $150,000 (household) to get this card.